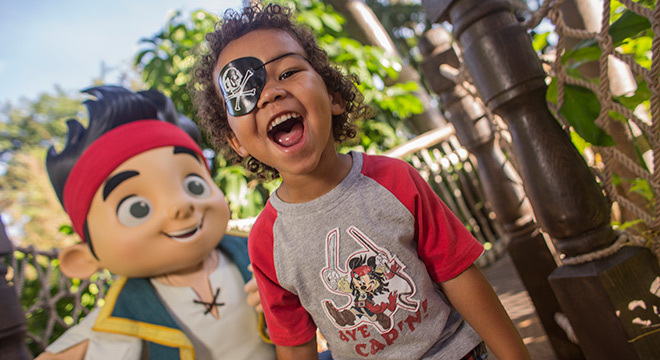 Watch your little one’s eyes light up with wonder as they meet their favorite Disney Characters and delight in attractions at all 4 parks. Plus, visit Disney’s Hollywood Studios to discover new Star Wars experiences. Experience a 3-night/2-day stay in a standard room at Disney’s All-Star Music Resort with theme park tickets for a family of 3—for just $908. Offer is valid for stays most nights Sunday through Thursday from April 14, 2016 through May 26, 2016. Book by February 28, 2016. Check availability for other great rates for stays most nights February 22 through June 11, 2016. Explore 3-night/2-day sample vacation package rates for a family of 3 within the chart below. Sample package prices based on 2 adults and 1 child (ages 3 to 9) in a standard or studio room. The number of rooms available at these rates is limited. Tickets are valid for one theme park per day and must be used within 14 days of first use. All Guests in the same room must be on the same package. Sample package price based on 2 adults and one child (ages 3 to 9) for a 3-night/2-day room and Magic Your Way base ticket package. 0 comments to "Kid Sized Walt Disney World Resort Getaway Offer for 2016"